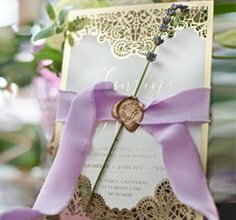 Our exclusive and exceptional handmade wedding invitations are stunningly unique and are perfect for the couple who want to capture the essence of their special day with something that will reflect their individual style and personality. Our in-house team of designers are passionately dedicated and devoted to bringing you pieces that are truly a work of art and promise to leave an impression on your guests. Giant prides itself on bringing you invitations of the finest designs, highest quality paper and carefully applied finishes. Our production process sets us apart with raised-ink printing, hand assembly and individual application of each decorative element including ribbons, pearls and crystals. Our collection of remarkable designs and handmade finishes will add that personal touch of difference to truly distinguish your wedding invitation from all those before you. By placing an order with us, you will have access to a free layout service by a professional designer who can assist in making your handmade invitation perfect. We will work closely with you to reflect your personal wedding style and we will incorporate your unique personality with any symbols or emblems that have special meaning to you in the layout of your design. During the digital proofing stage, we encourage our brides and grooms to add to the process by highlighting their distinctiveness through custom words, fonts and colours. This will ensure your cards truly represent your upcoming nuptials. If your average, stock standard wedding invitation just isn’t for you, browse our range of handmade unique styles to find an ideal one.